Uncharted 4: A Thief’s End will be released very soon. And as you know, studios often confirm downloadable content for new games ahead of their release and usually they want to charge for the best stuff. Well, Naughty Dog is taking things in a slightly different direction. It has confirmed that all Uncharted 4 multiplayer modes and maps will be released for free. That’s pretty awesome. While they were at it, Naughty Dog also confirmed that all vanity and gameplay in-game store items will be unlockable through gameplay. 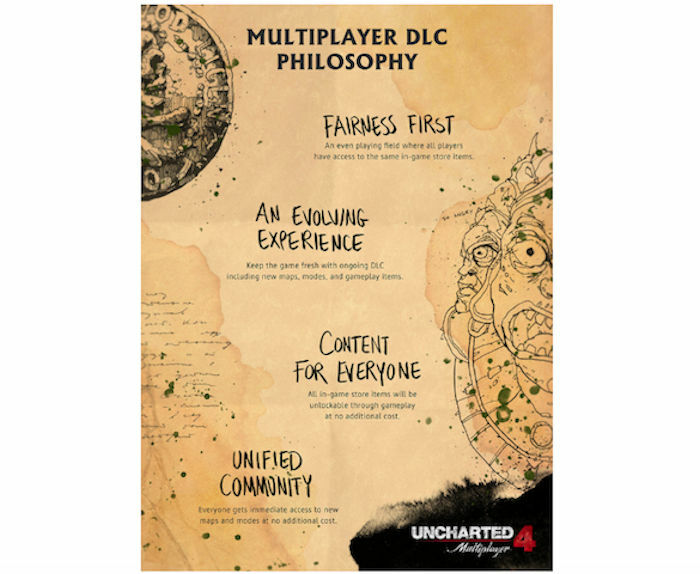 By doing this the studio is making sure that the multiplayer community is happy about DLC items and that those who are loyal in participating will be rewarded. That is a great move. These guys are really looking out for the players. This DLC approach is a new direction for Naughty Dog and they think it will have a positive impact and keep the Uncharted 4 multiplayer community thriving. It is always nice to see a company favoring fairness and good will toward its many players. The multiplayer maps and modes will be released simultaneously and Relics, the in-game currency, can’t be bought using real money. New content for the game will arrive in seasonal expansions through spring 2017 and most maps and modes will be released by fall 2016.